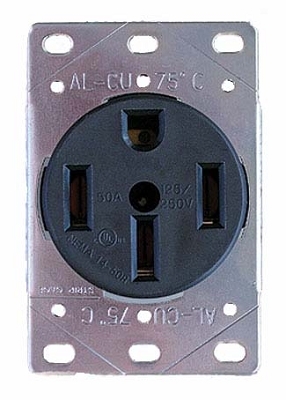 This female RV receptacle is made out of a high impact nylon, which is better suited to handle the heat created by heavy loads than that of the molded on variety. The sleek, compact design makes installation straight forward and easy. NEMA Compliant, two phase, 120/240 volts, 50 amp, 12,000 watts. 3 pole, 4 wire grounding accommodates 6/3 type wire with ground.